Hilda Vaughn, age 88, of Lakewood, NJ returned to her heavenly home on November 6, 2018 at Monmouth Medical Center. Hilda was born on January 20, 1930 in Lakewood, NJ to Walter & Lena Hill (predeceased). She graduated high school and enrolled into Nursing School while employed at Paul Kimble Hospital Housekeeping department. She received her Nursing Certification and began her new position within her educational specialty field as a Nursing Assistant. Many years afterward she joined Toms River Community Hospital Nursing Unit where she continued her passion in healthcare; then she retired from there in 1995. She was also a member of the Eastern Star of Lakewood, NJ. Hilda was a loyal and dedicated member of Greater Bethel Church of God in Christ since 1991. 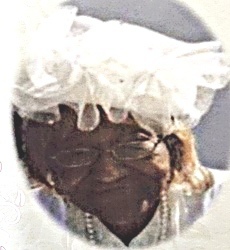 She was the President of the Usher's Ministry, Housekeeping Ministry, open the church for Noon Day Prayer, Mother's Board Ministry, President of the Pastor's Anniversary Blue Team and other aspects of the church under the late Superintendent Louis Rogers and continued with the current Pastor Jones. Hilda was dedicated and faithful to serving the Lord and her family. She enjoyed traveling, crusing, attending COGIC Conventions and enjoying life as God blessed her. She is preceded in death by her sons Albert Vaughn (Mary), Clyde Vaughn (Claire), Vincent Vaughn and Jeffrey Vaughn, her sisters Janie Cleamons, Gloria Hill, Blanche Hill, Hope Scott and Rachel Jordan. Hilda is survived by three daughters Cynthia Johnson (Thomas) of Fort Lauderdale, FL, Gloria Vaughn of NJ and Pauline Perez-Addy (Anthony) of Wilmington, DE; one son Terry Vaughn Sr. (Maureen) of Virginia; 2 adopted great-grandchildren Shashameca and Kashena Galloway and a daughter-in-law Betty Vaughn. She also has 15 grandchildren and a host of great-grandchildren and great-great grandchildren, nieces, nephews, cousins, her caregiver Janice King, friends and family.